What a cold, wet few days we had last week in Colorado Springs! Although it’s July, it felt like I should have been getting ready to watch the Georgia Bulldawgs kick off for the football season. The other night when I got home from work, I pulled out my flannel PJ bottoms and my Our Hen House sweatshirt from the back of the closet and sported them around the house because I was so cold. If I owned a snuggie, you better believe I would’ve had that on too! That night I made veggie chili, which is usually a staple around this house in the fall and winter months. 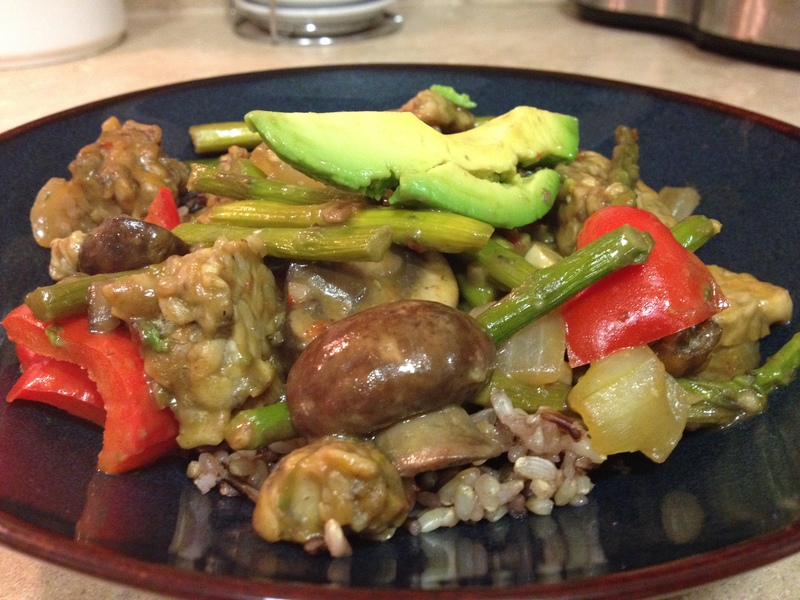 I also revamped a stir fry recipe on a stormy night last week. My oldest sister has always said she likes Asian food best when it’s cold out which I thought was an odd thing to say until I realized last week that I felt the same way. We’re more alike than I had thought! The Spicy Asparagus and Tempeh recipe came out of the recipe vault several months ago when I had bought asparagus and had no idea what to do with it. I remembered I had made this recipe years ago and somehow found it online again (thanks, Google!). I haven't made this dish in a super long time because I kind of forgot about it until today when I was trying to figure out what to make with asparagus. Here's the recipe: http://www.health.com/health/m/recipe/0,,10000001733510,00.html. I made some variations like adding red bell pepper and green onions. Also, I only used 2 tsp instead 2 Tbsp oil and I subbed the soy sauce for Bragg's Liquid Amino Acids. Turned out pretty good! This time when I made it, I wrote down some notes on how I changed it. This has become a very rare thing for me to do, which is why I haven’t posted any recipes in a long time. It’s my goal to start doing Meatless Mondays posts again – maybe not every week, but at least once a month. Here’s my version of this Spicy Asparagus and Tempeh recipe. I also think you could add broccoli to this dish and it would turn out pretty good. I hope you enjoy it, and hopefully it doesn’t take a cold, stormy night for you to make it! In a pot, mix one cup of rice with two cups of water. Bring to a boil, reduce heat and cover. Simmer until all of the water has been absorbed. Meanwhile, snap off tough ends of asparagus. Cut spears diagonally into 2-inch pieces. Set aside. Combine vegetable broth, amino acids, and flour in a small bowl; stir with a whisk until smooth. Set aside. Heat 2 teaspoons oil in a large nonstick skillet over medium-high heat. Add tempeh, and stir-fry 4 to 5 minutes or until golden. Remove tempeh from pan; set aside. Heat remaining 2 teaspoons oil in same pan. 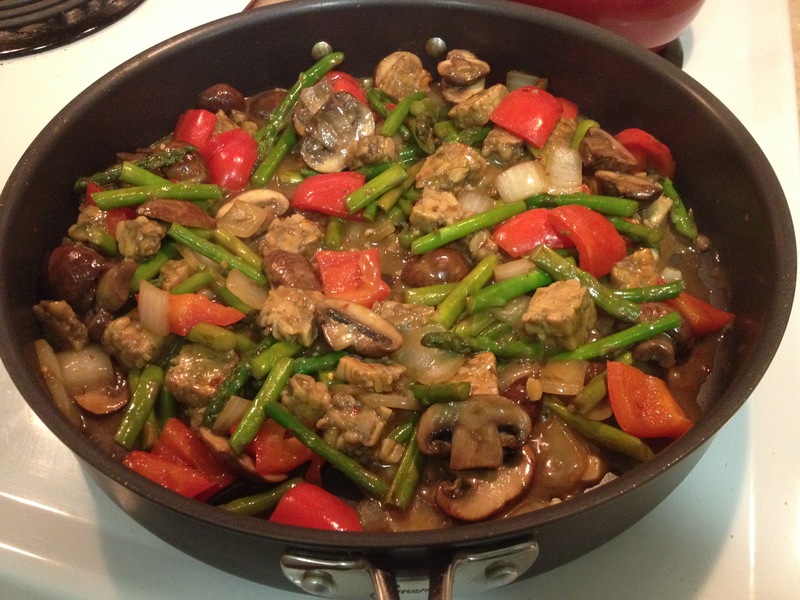 Add garlic, red pepper, asparagus, red bell pepper, onion, and mushrooms to pan, and stir-fry 5-10 minutes or until the veggies are tender. Add broth mixture; bring to a boil, and cook 5-7 minutes or until thickened. Add tempeh, and cook 1 minute or until thoroughly heated. Serve over rice. This recipe originated on My Recipes and can be found here. yum! lov meatless monday recipes 😀 thank you!